Cthulhu... this guy is a commissioned order... and actually a baby shower present. I don't question. This guy was fun to knit and looks even better in person! He even has little wings. 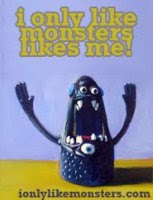 Here are some other monsters that I've finished recently... notice I've been going a bit crazy with the fun fur yarns.